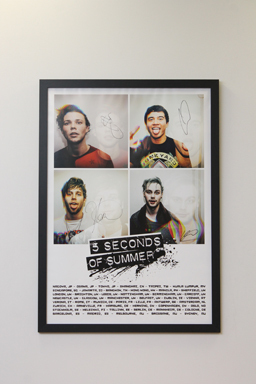 We love a giveaway here at GB Posters and thanks to our kind friends over at 5 Seconds Of Summer HQ we’ve got one of our best ever prizes up for grabs – a tour t shirt and framed poster both signed by the band! The winner drawn at random will receive both of these amazing prizes in time for Christmas to ensure you will be the envy of all our friends over the festive season! 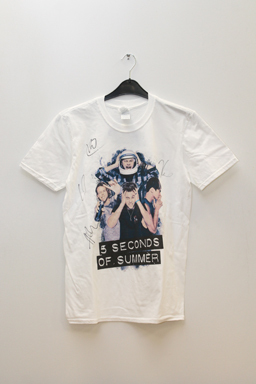 Each item has been personally signed by Luke Hemmings, Calum Hood, Ashton Irwin and Michael Clifford, the t shirt sizes are adults Small/Medium and unfortunately alternative size options are not available – even if the t shirt doesn’t fit we still think it makes a pretty cool piece of memorabilia to own. The poster features fantastic headshots of all four band members along with the dates for their sell out world tour in 2016, we’ve even been extra kind and put the poster in one of our best selling frames. Q: Who is the youngest member of 5 Seconds Of Summer?